Primary cardiac tumors are a rarity in any age group, but with improved imaging techniques increasing numbers are likely to be reported. In infants, primary tumors are found more frequently than metastatic ones, and most of them are benign. Malignant cardiac tumors are considerably more uncommon in infants. Here, we present an infant with intrapericardial desmoplastic small round cell tumor (DSCRT), a hitherto unreported location. A 4-month-old male infant born at 38 weeks gestation by normal vaginal delivery with birth weight of 2.5 kg was admitted in our institute. The child was asymptomatic until 3 months of age when he had an episode of fever and fast breathing for which he presented to the pediatrician. The child's mother gave history of pulmonary tuberculosis 2 years ago for which she was treated for 6 months. A cardiac mass was discovered on a chest X-ray taken for evaluation of the baby's condition. Subsequent computed tomography scan showed a large lobulated heterogeneously enhancing mass lesion in the right pericardial region closely abutting the lateral margin of the right atrium. A part of the mass extended inferiorly and caused focal indentation of theliver. No calcification or evidence of thickening of the pericardium was seen [Figure 1]a. At admission, the baby was dyspneic, with history of intermittent feeding. Echocardiogram showed large pericardial collection with features of cardiac tamponade with right atrial and right ventricular free wall collapse. There was a large mass within the pericardium which extended with tongue like projections into the liver [Figure 2]a and b. Pericardial tapping was done as emergency palliative measure. Cytology examination of pericardial fluid revealed no evidence of malignant cells. Two days later, a right anterolateral thoracotomy was performed to remove the mass. A lobulated mass was found arising from the right side of pericardium anterior to the phrenic nerve. The inferior aspect was going through the diaphragm. The healthy pericardium was dissected and still the stalk was found to to be attached to the diaphragm the diaphragm firmly, but was free from the liver. The central part of right diaphragm was excised along the mass, which could be removed in one piece. The defect in the diaphragm was closed with a dacron patch. The histopathology report was positive for MIC-2, pan cytokeratin (immunohistochemistry (IHC)) . Microscopic examination revealed a tumor composed of sheets of cells with hypersarcomatic nuclei and moderate cytoplasm [Figure 3]. Interventing blood vessels were seen. Frequent mitosis was seen. Excisional margin was clear of tumor. The child had a smooth postoperative course and was discharged in 4 days. Postoperative echocardiogram done after 1 month showed no residual mass lesion. Malignant tumors in infants are rarely reported. DSRCT is an aggressive soft tissue sarcoma. This rare tumor primarily occurs in the abdomen ,,,,, and may affect other sites including lymph nodes, lining of the abdomen, diaphragm, spleen, liver, chest wall, skull, spinal cord, large intestine, small intestine, bladder, brain, lungs, testicles, ovaries, and pelvis. It is a locally invasive tumor with reported sites of metastasis, include the liver, lungs, lymph nodes, brain, skull, and bones. The tumor is considered a childhood cancer that predominantly affects boys and young adults. The tumor belongs to the category of small cell tumors. Pathologists William L Gerald and Juan Rosai first described the entity in 1989. Other common members of this group being Ewing's sarcoma, neuroblastoma, Wilms' tumor, and non-Hodgkin's lymphoma. The first histopathological evaluation of a suspected case of DSRCT would show a small cell tumor. On immunohistochemistry, cells have trilinear coexpression including the epithelial marker cytokeratin, the mesenchymal markers desmin and vimentin, and the neuronal marker neuron-specific enolase. The diagnosis is confirmed by the presence of a polyphenotypic immunoprofile (tumor cells express several cytokeratins (KL1, AE1/AE3), desmin, and neuron-specific enolase), and by molecular identification (fluorescent in situ hybridization (FISH) and reverse transcription polymerase chain reaction (RT-PCR)) of the EWSR1/WT1 translocation. DSRCT is associated with a unique chromosomal translocation (t11;22) (p13: q12)  resulting in an EWS/WT1 transcript  that is diagnostic of this tumor. This transcript codes for a protein that acts as a transcriptional activator that fails to suppress tumor growth. The EWS/WT1 translocation product targets equilibrative nucleoside transporter 4 (ENT4). ENT4 is also known as Plasma membrane monoamine transporter (PMAT). Clinical signs and symptoms of DSRCT are related to its location. Our patient presented with symptoms probably related to the tamponading effect of pericardial fluid accumulation that was relieved with pericardiocentesis. There was no local hepatic involvement. Hence, the entire tumor bulk could be excised with adequate margins in one piece. Management of DSCRT is multidisciplinary. Up to 30% of DSRCT cases are misdiagnosed leading to incorrect management. No validated recommendations on clinical management are available. A few centers propose aggressive multiagent chemotherapy (off-label use), followed by optimal cytoreductive surgery and abdominal radiotherapy. Prognosis is poor. Median overall survival is 17 months and less than 20% of patients live more than 5 years after diagnosis. The follow-up in the reported patient is only for 1 month; it is too early to comment on recurrence. We believe that a well encapsulated tumor with wide excision and a tumor-free margin may have been sufficient in our case as no distant metastatic foci could be located. The aim of the present manuscript was to highlight presence of the rare tumor in such a location in an infant. The limitations of the case report include lack of a consensus management protocol for such a case. The management plan including chemotherapy and radiotherapy needs to be discussed in a wider forum. Further management of the infant is still being considered. Lee YS, Hsiao CH. 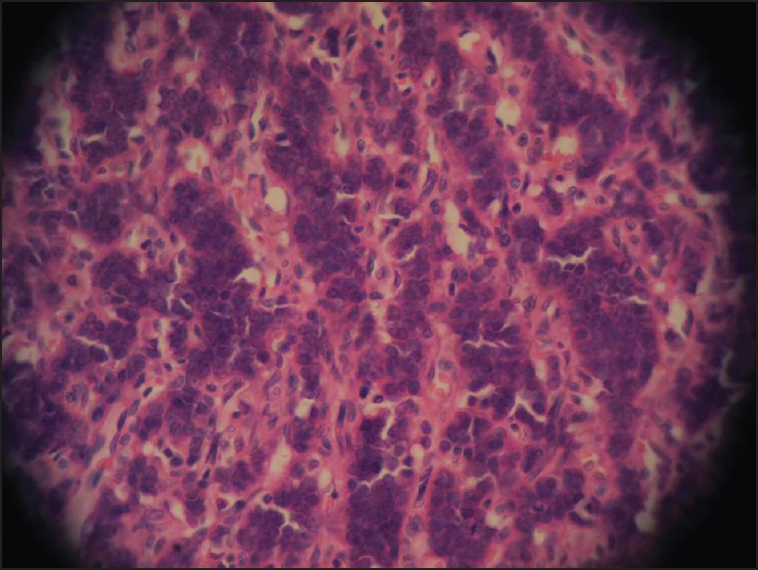 Desmoplastic small round cell tumor: A clinicopathologic, immunohistochemical and molecular study of four patients. J Formos Med Assoc 2007;106:854-60. Bland AE, Shah AA, Piscitelli JT, Bentley RC, Secord AA. Desmoplastic small round cell tumor masquerading as advanced ovarian cancer. Int J Gynecol Cancer 2008;18:847-50. Murphy AJ, Bishop K, Pereira C, Chilton-MacNeill S, Ho M, Zielenska M, et al. A new molecular variant of desmoplastic small round cell tumor: Significance of WT1 immunostaining in this entity. Hum Pathol 2008;39:1763-70. Gerald WL, Haber DA. The EWS-WT1 gene fusion in desmoplastic small round cell tumor. Semin Cancer Biol 2005;15:197-205. Talarico F, Iusco D, Negri L, Belinelli D. Combined resection and multi-agent adjuvant chemotherapy for intra-abdominal desmoplastic small round cell tumor: Case report and review of the literature. G Chir 2007;28:367-70. Aguilera D, Hayes-Jordan A, Anderson P, Woo S, Pearson M, Green H. Outpatient and home chemotherapy with novel local control strategies in desmoplastic small round cell tumor. Sarcoma 2008;2008:261589. Lal DR, Su WT, Wolden SL, Loh KC, Modak S, La Quaglia MP. Results of multimodal treatment for desmoplastic small round cell tumors. J Pediatric Surg 2005;40:251-5.